Nicknames "El Hombre de Acero"
Maestro(s) Caudillo II, El Bigotes, Angel Mensajero, Mr. Tempest, Black Shadow Jr.
Signature moves Iron Special, Plancha Suicida at 6 meters of height. 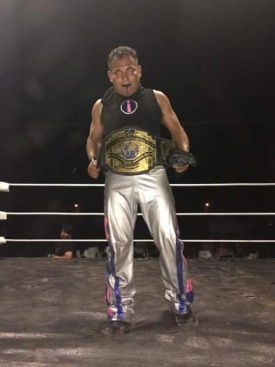 Being the son of the veteran luchador Play Boy and the first luchadora of Mexicali Woman Star, Iron Boy's involvement with lucha libre began since he was a child. In 1997 he began his training in the now defunct Arena Huracan Ramirez with Patricio Gomez "El Bigotes" as his first maestro. After him there were other important trainers in his career such as Angel Mensajero, Caudillo I, Mr. Tempest, and Black Shadow Jr. He had difficulties in his early days in wrestling due to his very young age. He was 15 years old when he started and the Commission did not allow wrestlers under age. He started at exhibition matches. It took time for him to climb in the ranks, from "luchas de regalo" (dark matches), to first matches at Arena Huracan Ramirez and at Parque Vicente Guerrero in "Domingos Populares". He went to undercard train eventer with his own efforts. His his ring name was Play Boy Jr after his father until he had to change it due to name issues. He adopted one of his father's former names "La Cachora Voladora" he used it for a while on and then renamed as Silver Boy. After that he went as El Luchador Sin Nombre he made a survey for a possible name for him. There was a list with possible names and the most voted was Iron Boy. He liked and he took it. Besides of his Championship wins, Iron Boy won Sammy's Promotions Trios Cup on two years in a row. The first time with the Hego Boys on 2014 at Palenque del Fex in Mexicali, Baja California. The Second time was with the Legion Aerea on 2016 at Palenque del Fex in Mexicali, Baja California. On March 26, 2017 he became the new Baja California Welterweight Champion defeating Rey Cobra at Arena Nacionalista. On June 24, 2017 he won another Cup at Palenque del Fex, Mexicali, Baja California in a battle royal. Iron Boy has helped training wrestlers since 2003. In later years he founded his own school, Iron Boy Príncipe Wrestler School. So far, he had trained 9 generations and about 24 profesional wrestlers.